The world would be a simpler place if everyone was happy with their lot in life. Of course, the world would also be very dull and stupefyingly boring with no progress or change. The reality is that some people want to change their own position in the world and make it better for themselves and sometimes, they will do things that hurt others in order to achieve their aim. 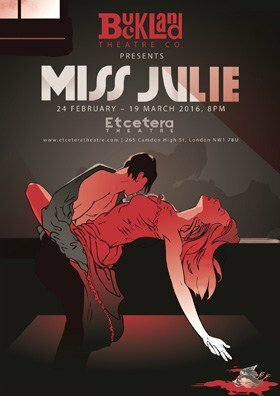 A prime example of this can be found in Buckland Theatre Company’s production of Miss Julie at the Etcetera Theatre, Camden. On Midsummer’s Eve, and in the kitchen of the great house, the cook, Kristin (Danielle Henry), is getting everything ready for the return of her intended, the Count’s valet Jean (Charlie Dorfman) who has been seeing his master and the family off. Even by valet standards, Jean is a superior young man. He is well-travelled, well-spoken and knows much about the world. Like Kristen, ultimately he knows his place in the pecking order of society and he also knows what is right and wrong socially. Tonight, he is shocked by the behaviour of the Count’s daughter Miss Julie (Laura Greenwood) who is attending the local barn dance and has been dancing in an unseemly manner with members of the household and people from the local village. While the two are discussing her ‘goings on’ Miss Julie enters the kitchen and tries to convince Jean to go back to the barn dance with her. Although reluctant as he had promised a dance to Kristen, Jean is eventually ordered to accompany Miss Julie back to the dance, leaving Kristen alone in the kitchen. When the two of them return, Kristen is asleep, leaving Jean and Miss Julie time to talk alone and possibly really indulge in some midsummer madness of their own. Miss Julie was originally written in 1888 by August Strindberg and is described as a “naturalistic play”. Now I’m not 100% sure what that means but I found it to be a very deep and dark play that set out to overturn the – at the time – perceived natural order of things. I could imagine it causing quite a stir when first performed as the narrative took the power from those of high birth and gave it to the lower class. But before delving into the deeper side of the play, let’s take a look at the production itself. I really loved Carla Goodman’s set which really created a completely believable kitchen on the first floor of a pub in Camden. Sitting there before the play started, I was amazed at the level of detail in the set, every time I looked again, there was something new to see and this really set an expectation that the play itself was going to be really good – which I’m pleased to say it turned out to be. With a cast of three, it is really important to ensure that not only are they convincing in their roles but their relationships between each other is believable and this production did that very well. I disliked Jean from the start – and I’m not even sure why. There was something about the character – beautifully portrayed by Charlie – that pretty much instantly put my back up. By the second half I had really gone off him and wanted both Kirsten – who could do so much better- and Miss Julie to turn on him together, but unfortunately, the Jean’s of this world don’t always get what they deserve. Superb acting. Turning to Laura Greenwood as Miss Julie and wow what a performance. Turning from the spoiled autocratic daughter of the lord in the first half to the desperate, panic-stricken child of the second was a wonderful piece of acting by Laura that had me on the edge of my seat seeing where Miss Julie was going to go. Finally, Kristen is the smallest of the three roles but Danielle Henry really made the most of her stage time. Of the three, Kristin was the only one I rooted for throughout. She may have been a simple soul with simple beliefs but she was the most honest and ultimately worthy person. I’ve given a lot of credit to the actors so far but let’s also mention the wonderful direction of Gary Condes and Michael Meyer’s translation of the play which really stays faithful to the original ideas within it. And it is a really deep play which, while there are virtually no laughs throughout – avoids becoming overwhelming in its portrayal of these three people and their loves. It is a surprisingly gripping story. My one quibble with the production is that it should have had an interval. I realise this is not always possible but there needed to be a proper gap – and it’s obvious where that should be – otherwise it is a lot of emotion to take in over the course of one sitting. However, this is a very strong production of a surprising play that really grips and holds onto its audience, even at those points where they would like to turn away – and leaves the ending open just enough so that the viewer can decide whether what happens next is good or bad for all concerned. On Midsummer’s Eve, wishes are meant to come true. But, as Miss Julie becomes ever more deeply entangled with her father’s valet, dreams turn to disappointment – with tragic consequences. Strindberg’s masterly study of class, desire, and the ties that bind us caused a scandal when it was first performed, and remains searingly relevant today.